A new 33,000 square foot academic building that houses the Natural Science Labs as well as the Community and Environmental Studies Program. The building’s exterior was designed to complement the Georgian revival architecture of the campus. As a lab and science building, a significant amount of HVAC equipment is required. Its visual impact on the campus was reduced by creating a mechanical penthouse floor that is within the sloping roofs of the structure. The organizational concept for the building was to position the main corridors “off center” to facilitate access to natural light and views of the surrounding mountains. Faculty offices were located on the “narrow” side of the corridors to maximize their window access. 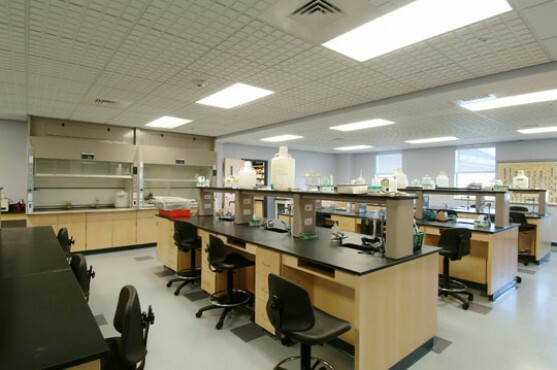 The laboratory spaces include chemistry, biology, earth science, microbiology, and environmental sciences. In addition to the labs, there is a ramped lecture hall with seating for 180.